Universal Design helps produce buildings, environments and products that are inherently accessible to everyone. Within a play environment, this takes on added importance as we consider the wide variety of ages and abilities that use park and play areas. While there are so many factors to consider when designing a play environment, our Top 5 are listed below. Universal Design creates the greatest access, but minimum requirements need to be met too! 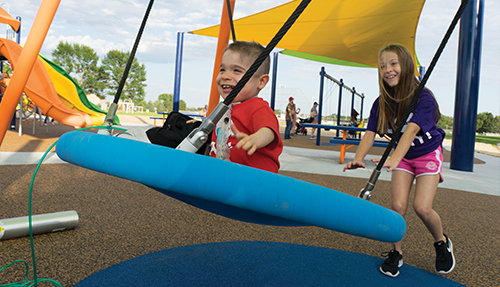 The Americans with Disabilities Act (ADA) is the guideline for playgrounds and needs to be followed at a minimum. 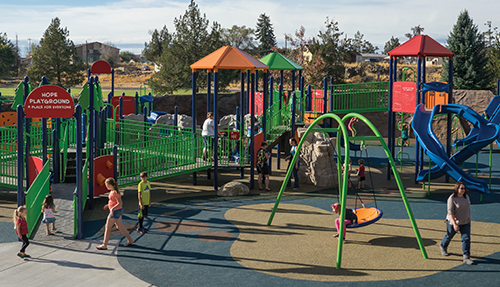 Children aren’t the only users of park and playground areas – most of them need caregivers to bring them to the park and, studies show, the more comfortable and accessible a space is for caregivers, the more time kids will spend at the park. Products like Novo™ Playful Furniture provide caregivers a comfortable, accessible space to rest and socialize while providing children a fun place to climb, balance or observe until they are ready to play. Caregivers can be inside the playspace with the children while giving them the autonomy to play on their own when appropriate. It’s important that everyone be challenged and fulfilled by play and this can be difficult with so many children of different ages and abilities playing in the same space. But it is more than doable with the right products and designs. Having a variety of play pieces that offer imaginative, cognitive, social, emotional and physical development is key to having the best possible space. For example, the Roller Slide offers a unique sensory experience and allows two children to slide down together. It is also unique because it doesn’t create the static electricity that prevents children with cochlear implants from using many slides. Kids see a slide but beneath the surface, there is so much more! Also adding Taktiks Climbers to a play environment can challenge children at different levels and allow them to create new climbing routes each time. They also allow children at different levels of climbing to take different routes yet still be in the same space. Having access to the play environment is important because if people of all abilities can’t access the playspace, they can’t benefit and learn from play. Creating access doesn’t just mean the ability to get into the playspace, although that is obviously important. On a deeper level , it means making the heart of the play environment and the most exciting attributes accessible to all users who wish to partake in a particular activity. This gives everyone the ability to play shoulder to shoulder with their peers and learn and grow together. 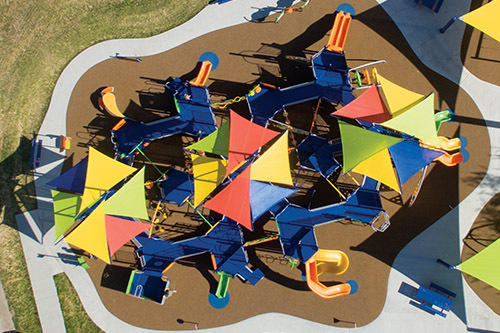 Double Wide Ramps, spinning social spaces like the Volta™ Inclusive Spinner and the Konnection™ Swing offer opportunities for children of all abilities to play side by side and work together in a way that benefits everyone. Play environments should be designed to be understandable and intuitive for all users. Routes to and throughout the play environment should guide users to the areas they are looking for and provide natural boundaries. 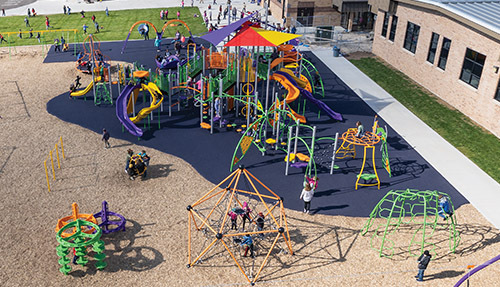 Users should be able to flow naturally throughout the space without barriers to play or interaction and be able to enjoy the benefits of play while feeling smart, capable and excited.